Well done to the under 16’s who beat Aughavas in the 11 a side final in Dromod on Saturday. We play Allen Gaels in the Junior “ B “ final on Saturday next October 17th. Details of venue and time here soon. In Division 1 wee play Drumreilly in Annaduff on Sunday at 2pm. Congratulations to Fergal Carroll and Dermot Reynolds who were on the St. Marys team who won the Senior Hurling final on Saturday. Despite shooting seventeeen wides we qualified for the final of the Junior “B” Championship by beating Aughavas by 1-10 to 1-07 in Dromod on Sunday. Aughavas dominated the early exchanges and led by four points after 23 minutes however a strong finish to the first half by Annaduff left only one point between the sides at the break Aughavas leading by 0-6 to 0-5. Aughavas got the first goal of the match after forty minutes . Gus Garvey got Annaduffs goal after good work by Ciaran McLoughlin after 44 minutes. A Seamus McBrien point after 45 minutes left the sides level at 1-7 each. Annaduff however finished the stronger scoring the last three points from Ciaran McLoughlin, Gerry Newton and Enda McHugh. Thomas Flanagan had an excellent game at full back where he did an excellent marking job on Padraig McLoughlin, others to impress were Daniel Duignan, Martin Faughnan, Enda McHugh, Ciaran McLoughlin and Gus Garvey while our midfielders Gerry Newton and Sean Maxwell despite been in trouble early on finished the game dominating midfield. Annaduff : Jim McCormack, Peadar Beirne, Thomas Flanagan,Padraig McGlynn Daniel Duignan, Martin Faughnan ( Capt), Ronan Cox, Gerry Newton ( 0-1), Sean Maxwell , Seamus Mulvihill, Enda McHugh(0-4),Cian Ward , Ciaran McLoughlin ( 0-4),Gus Garvey ( 1-1), Padraig Dunne. Subs used :Derek Cox and Matthew Reynolds. Deepest sympathy is extended to Antoinette McGuinness and Maura Ward on the death of their uncle Fr. Eugene Loughlin. May he rest in Peace. At the draw held in Taylors of Drumsna , there was no Jackpot winner. The numbers drawn were : 12,16,15 and 16. The € 50 winner was Helen Dowling, Dromod. The €25 winners were Derek Crowe, Dromod, John Joe Reynolds, Dublin,Peadar Beirne, Drumgildra and Adam Maxwell, Furnace. The next draw will be held in the Brandywell, Dromodon Sunday night next with a Jackpot of €4,500. Congratulations to Bertie Glancy on his marriage to Caroline Grant, Ballyliffen, Co Donegal. We wish Bertie and Caroline many years of happiness. Congratulations to Oriel Cox on her engagement to Gareth Glancy, Kilmore. Congratulations to Ray and Clare Ward, Cong on the birth of a baby girl. In the Leitrim Senior Championship played over the weekend Cian Condon played for Gortletteragh while Fergal Carroll and Dermot Reynolds played for St. Marys. We play Aughavas in the semi final in Dromod on Sunday at 2pm. Deepest sympathy is extended to Siobhan and Robert Healy on the death of Robert’s fathher Robert Healy, Moate. May he rest in Peace. Congratulations to the three winners over the weekend Cloone, Aughavas and Glencar/ Manor. Our neighbours Eslin put up a brilliant performamce in the junior final while the senior final was a great advertisement for Leitrim football, the best final in years. We qualified for the semi final of the Junior “B” Championship by beating Glencar/Manor by 1-12 to 0-11 in Leitrim on Saturday. A combination of youth and experience gave us a well deserved four point winning margin. In a very enjoyable encounter we led by 1-5 to 0-7 at the break.Our full back line were in trouble early on against a strong Manor full forward line however they gradually got on top and were the rock on which this win was achieved . Peadar Beirne , Thomas Flanagan and Padraig McGlynn all gave excellent displays.With Manor leading by a point after 15 minutes Gerry Newton got the crucial score of the match a goal with a well struck ground shot. Enda McHugh and Ciaran McLoughlin added points before half time to leave us leading by a point at the break.The second half was equally close but with Sean Maxwell and Gerry Newton pulling the strings in the middle of the field and with Gus Garvey and Ciaran McLoughlin playing very well up front we held on for a win and a place in the semi finals. . Annaduff : Jim McCormack, Peadar Beirne, Thomas Flanagan,Padraig McGlynn Daniel Duignan, Martin Faughnan ( Capt), Ronan Cox, Gerry Newton ( 1-0), Sean Maxwell ( 0-1), Seamus Mulvihill, Gus Garvey(0-1),Cian Ward ( 0-2), Ciaran McLoughlin ( 0-2),Enda McHugh ( 0-6,0-4 from frees), Padraig Dunne. Subs used :Derek Cox and Matthew Reynolds. Deepest sympathy is extended to the Guckian family on the death of Mary Guckian ( nee Doherty) aunt-in-law of Des and Pauric and to the Reilly family on the death of Philip Reilly uncle of Tom and Philip. May they rest in Peace. At the draw held in Cox’s Steak House Bar , there was no Jackpot winner. The numbers drawn were : 1,4,15 and 19. The € 50 winner was John Dowling, Dromod. The €25 winners were John Cox, Antfield, Damien McGuinness,Liscloonadea, Michael Kelly, Rooskey and Tom Morrison, Kilnagross. The next draw will be held in Taylors of Drumsna on Sunday night next with a Jackpot of €4,400. Congratulations to Elish and Michael Rowley on the birth of a baby boy. 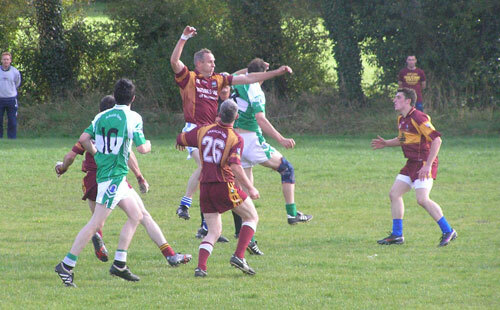 We had a comprehensive 1-14 to 1-5 win over Ballinamore in Division 1 in Ballinamore on Saturday last. 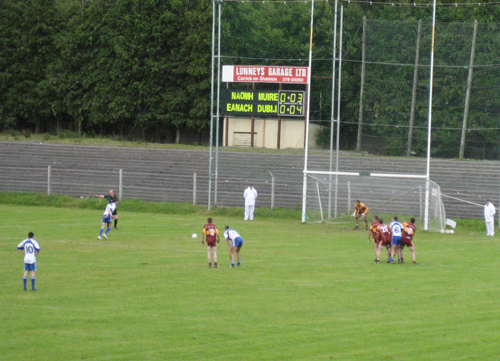 Padraic Carroll buried the ball to the Ballinamore net after 30 seconds. We scored another ten points before half time with Ballinamore getting just one point after twelve mintes. Alan Cox had a superb first half scoring six points all from play. Ballinamore came more into the game in the second half and outscored Annaduff 1-4 to 0-5 in this period a last minute goal from the penalty spot putting respectabilty on their score. This was Annaduffs best performance all season against a Ballinamore side who had a very good championship campaign. In a fine all round team performance Alan Cox was “man of the match”. We are sixth in Division 1 with 10 points from 10 games. Annaduff :Kevin Ludlow, Matty Cox, Dermot Reynolds, James Cox, David Duignan, David McHugh, Chris Farrell, Brendan Guckian, Fergal Carroll, Enda McHugh ( 0-1), Ray Cox ( 0-5,0-4 frees), Alan Cox (0-6), Conor McLoughlin, Padraic Carroll (1-1),Joe Cox. Subs used : Ronan McCormack, Sean McNabola (0-1), Nigel Cox, Ml. Rowley, Gerard Reynolds. Kevin Ludlow was the Leitrim Goalkeeper on the team that drew the Masters Shield final against Dublin. Congratulations to Alan and Maggie Cox on the birth of a baby boy. Congrats also to the proud grandparents Francis and Mary. At the draw held in Duignan’s of Drumsna, there was no Jackpot winner. The numbers drawn were :17,19,20 and 23. The €50 winner was Sarah Harte, Aughintass. The € 25 winners were Veronica Kenny, Corrick, Carmel O’Connor, Dromod, Bridie Cox, Antfield and Gordon Murray, Elphin.The next draw will be held on Sunday night next in Cox’s Steakhouse Bar with a Jackpot of €4,300. We qualified for the quarter finals of the Junior “B” Championship by beating Aughawillan by 3-9 to 1-4 in Gortletteragh on Sunday. A combination of youth and experience gave us an eleven point winning margin. The half time score was 1-7 to 1-0 in Annaduff’s favour, the goal was scored by Seamus Mulvihill after 11 minutes. Our two second half goals came from Ciaran McLoughlin and Gus Garvey. Annaduff :Jim McCormack, Padraig McGlynn, Thomas Flanagan, Daniel Duignan, Martin Faughnan ( Capt)(0-1), Ronan Cox, Gerry Newton ( 0-1), Sean Maxwell, Cian Ward, Gus Garvey (1-3), Seamus Mulvihill ( 1-1), Padraig Dunne (0-1),Paddy Garvey, Ciaran McLoughlin (1-2). Subs used : Matthew Reynolds, Derek Cox, James Faughnan, Carl McLoughlin, Cian Condon. We retained their Intermediate Championship status with a hard earned 1-9 to 1-6 win over Allen Gaels in Dromod on Saturday evening. This result looked highly unlikely when the Gaels led by 1-3 to 0-1 after 20 minutes. 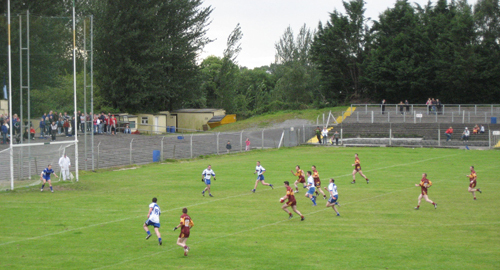 Ray Beirne opened Allen Gaels account with a point after 2 minutes. Enda McHugh replied with a point for Annaduff. Martin Beirne and Thomas Nolan added further points for the Drumshanbo team and in the 20th minute Martin Beirne buried the ball to the Annaduff net to give Allen Gaels a five point lead 1-3 to 0-1. Four minutes later Michael Rowley gave Annaduff a lifeline with a goal from a well taken penalty.Sean McNabola and Gerard Reynolds added points with Gearoid Lynch finishing the first half scoring with a point to leave Allen Gaels leading at the break by 1-4 to 1-3. On the resumption Padraic Carroll pointed for Annaduff, this was followed by points from Enda McHugh, Padraic Carroll again and a well taken point by substitute Marcus Guckian to give Annaduff a three point lead after 48 minutes.Stephen McWeeney and Ml. Rowley exchanged points. Martin Beirne pointed to leave two points between the sides with four minutes remaining. 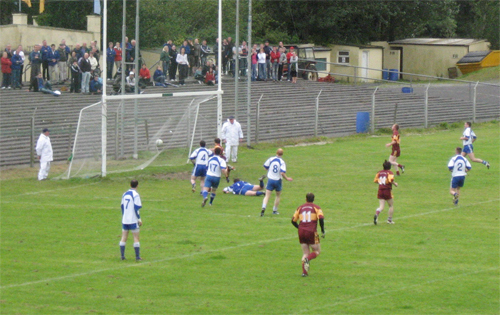 Sean McNabola got the last score of the match a point for Annaduff after 59 minutes. Annaduff : Barry Daly, Paul Farrell, Thomas Flanagan, Noel Ward, Ml. Faughnan, Ml. Rowley ( 1-1),Sean McNabola (0-2), Ronan McCormack, Aaron O’Connor , Colm Cox, Padraic Carroll ( 0-2),Enda McHugh ( 0-2) , Niall Maxwell, Dan O’Reilly, Gerard Reynolds ( 0-1). Subs used : Martin Faughnan, Marcus Guckian(0-1) and Gus Garvey. Annaduff lost by one point to Dromahair in the under 14 final on Friday evening in Ballinaglera .In an excellent match they led for most of the way and were probably unlucky to lose in the end. Our thanks to the panel , officials and also to the large numbers of supporters who came to Ballinaglera. The Gold Rush Draw has been postponed until later this year. The scoreline tells the story of a one sided Intermediate Championship match played in Drumshanbo on Saturday. Glencar/ Manor were always in command against what looked on paper a strong Annaduff outfit. Evan Sweeney opened Glencar/ Manor account with a point after 50 seconds. Gerard Reynolds replied with a pointed free for Annaduff and after 6 minutes Enda McHugh gave Annaduff the lead with a point. Glencar/ Manor replied with five points in succession from Gerard Hickey, Evan Sweeney, James Gilmartin and two from Gary Hickey to leave the score 0-6 to 0-2 after 18 minutes. On 20 minutes Gerard Reynols got a rare Annaduff point. Glencar/ Manor got four points in a row from Evan Saweeney, Alan Sweeney with two and Alan Hickey. Sean McNabola gave Annaduff some hope when scoring the last point of the half to leave Manor leading at the break by 0-10 to 0-4. The story was the same in the second period as Annaduff failed to take advantage of a strong wind. Gerard Reynolds opened the scoring in the second half with a point but then Manor took complete control with a well taken goal from Alan Hickey and two points each from Gary Hickey and Alan Sweeney. Annaduff received a further blow after 50 minutes when full back Thomas Flanagan received a second yellow followed by a red card. Centre Forward James Gilmartin scored two points for Manor in the 51st and 50nd minute.Evan Sweeney and Sean McNabola then exchanged points. Evan Sweeney and substitute Ronan McGouty got two more points before Annaduff got some consilation with the last score of the match a well taken Sean McNabola goal after good work by Enda McHugh. Barry Daly and Sean McNabola were impreeive for a poor Annaduff. .Annaduff : Barry Daly, Paul Farrell, Thomas Flanagan, Ml. Faughnan, Sean McNabola (1-2), Michael Rowley, Noel Ward, Ronan McCormack, Aaron O’Connor , Micheal O’Dowd,Enda McHugh ( 0-1) , Colm Cox, Gene Cox, Dan O’Reilly, Gerard Reynolds ( 0-3). Subs used : Marcus Guckian and Ciaran McLoughlin. At the draw held in the Brandywell, there was no Jackpot winner. The numbers drawn were :4,8,14 and 18. The 450 winner was Peter Gill, Drumsna. The € 25 winners were Derek Crowe, Dromod, Shauna Thornton, Derrycarne, May Baxter, Keadue and J.P. Barry, Gowel. 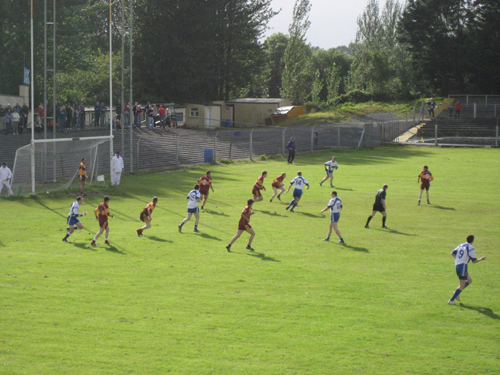 In the Junior “B 2 Championship we drew with Fenagh St. Caillins in Ballinamore on a scoreline of 1-10 each. We were probably unlucky as we were generally the better team. Annaduff led at the break by 1-5 to 1-4. The highlights of the first half a goal well taken by Padraig Dunne and a spectactular point from Paddy Garvey.We led by 1-9 to 1-6 after 50 minutes however Fenagh finished strongly and led by a point after 59 minutes with Enda McHugh saving the day for Annaduff with a point at the finish. Annaduff : Jim McCormack, Carl McNabola, Thomas Flanagan, Peadar Beirne, Padraig McGlynn, Martin Faughnan ( Capt. ), Ronan Cox, Gerry Newton, Sean Maxwell, Ciaran McLoughlin ( 0-2), Enda McHugh ( 0-5,0-2 from frees), Cian Ward, Padraig Dunne (1-2),Niall Hanrahan, Paddy Garvey (0-1). Subs used : Derek Cox and Daniel Duignan. Annaduff play Dromahair in the under 14 final on this Friday evening at 7pm.Please come out and support. See pbserver for venue. Our Seniors have reached the quarter finals after the draw betweeen Mohill and St. Marys. They will play Carrigallen. Although they were outclassed by a much stronger Gortletteragh team our Intermediate team gave a good account of themselves when losing by 0-17 to 0-5 in Pairc Sean on Saturday.They were in arrears by 0-4 to 0-9 at half time. Annaduff first half points came from Sean McNabola, Gerard Reynold and an excellent free from Padraig Carroll. Our only second half point came from Aaron O’Connor. Barry Daly brough off two great saves while others to impress were Paul Farrell, Fergus Beirne, Aaron O’Connor, Noel Ward and Micheal O’Dowd.Annaduff : Barry Daly, Paul Farrell, Dan O’Reilly, Fergus Beirne, Sean McNabola (0-2), Michael Rowley, Noel Ward, Ronan McCormack, Aaron O’Connor ( 0-1), Micheal O’Dowd, Padraic Carroll ( 0-1), Colm Cox, Niall Maxwell, Gerard Reynolds ( 0-1), Ml. Faughnan. Subs used : Marcus Guckian. Our Championship dreams are still alive after a hard earned one point 1-6 to 1-5 win over St.Marys on Saturday evening. Qualification now depends on the result between Mohill and St. Marys with many different possibilities. It was a poor match but the result was all important with Annaduff playing much better in the second half and showing great fighting spirit to come back and win after Carrick went three points ahead after 40 minutes. Duignans goal was crucial after 45 minutes. The sides were level at 0-3 each at the break with the Annaduff first half points coming from Alan Cox, Joe Cox and Cathal Cox. In the first half Kevin Ludlow saved a certain goal when he tipped over a goal bound shot from Nicholas McWeeney. Ray Cox gave Annaduff the lead with a pointed free two minutes into the second half. Carrick got a penalty three minutes later with Ray Mulvey scoring from the spot. James McGreal gave them a three points lead with a point. On 45 minutes David Duignan’s superb goal put the sides level. With six minutes remaining Ray Mulvey gave Carrick the lead with a point. Padraig Carroll coolly slotted over a free off the ground after 59 minutes with midfielder Brendan Guckian getting the last and vital score of the match a well-taken point. There are a number of permutations regarding the Mohill / St. Marys match however a Mohill win or a Draw or a Marys win by eight points or more would all guarantee qualification for Annaduff. Annaduff :Kevin Ludlow, Matty Cox, John Faughnan, James Cox, Conor McLoughlin, Dermot Reynolds, David Duignan (1-0), Brendan Guckian (0-1) , Fergal Carroll, Sean McNabola, Ray Cox ( 0-1,0-1 from frees), Alan Cox ( 0-1), Joe Cox (0-1), Padraig Carroll (0-1,0-1 from frees), Kenny Bosquette. Subs: Cathal Cox (0-1) ( for S. McNabola), Ronan McCormack ( for C. Cox), David McHugh ( for K. Bosquette), Chris Farrell (for M.Cox), Chris Farrell ( for J.Cox). Deepest Sympathy is extended to the O’Donnell family on the death of Peter O’Donnell. May he rest in Peace. Congrats to our neighbours on the opening of their pitch and dressing rooms on Sunday. Well done to our under 12 team who put up a spirited display against Fenagh as part of the official opening weekend. Ray Cox gave Annaduff the lead with a pointed free two minutes into the second half. Ray Cox gave Annaduff the lead with a pointed free two minutes into the second half. 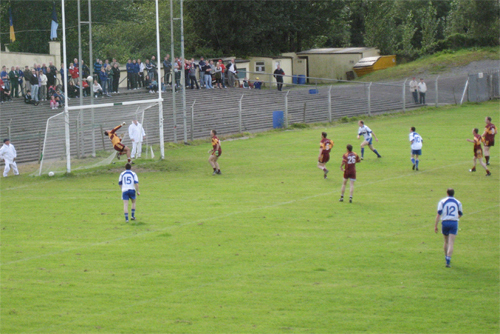 Carrick got a penalty three minutes later with Ray Mulvey scoring from the spot.